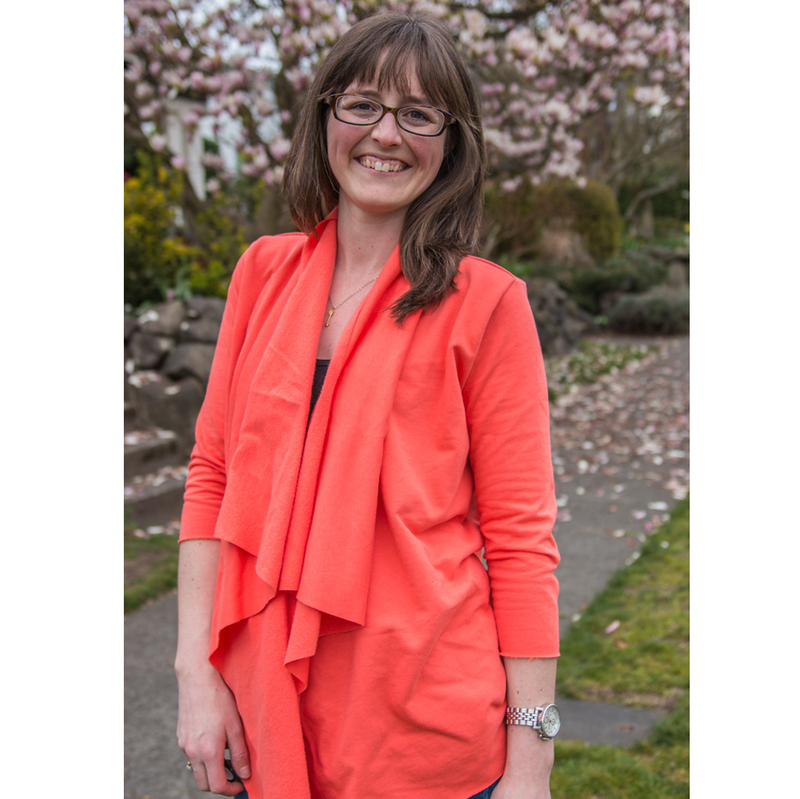 Laurelhurst is casual meets refined with draped front detail and three sleeve lengths. It’s perfect for coverage while nursing and can be worn at any stage of pregnancy or postpartum. 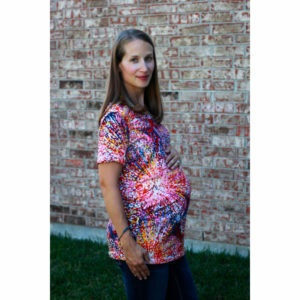 This pattern is suited for all stages of maternity and post-partum – trimesters 1, 2, 3, & 4 and works well to provide coverage while nursing. Laurelhurst is casual meets refined with draped front detail and three sleeve lengths. 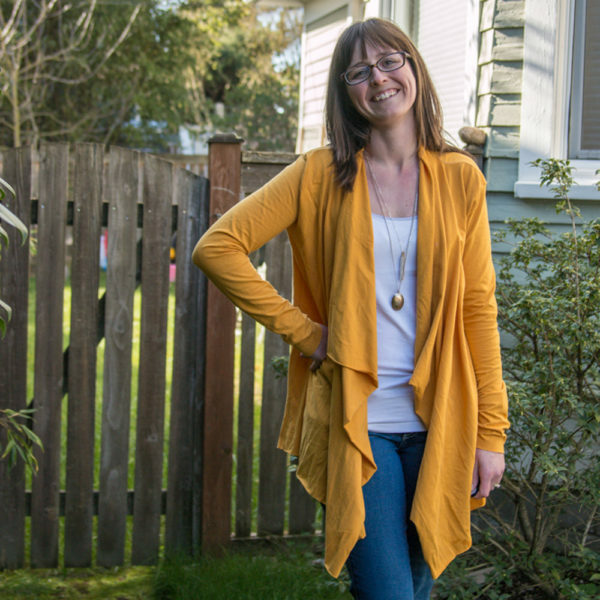 Laurelhurst can be sewn up in a wide range of knits to give you the perfect layer for running errands or sew it up in a sweater knit for night out with friends. You can even add a button to give it an additional look. Cotton Lycra, Ponte de Roma, French Terry, Lycra Spandex, ITY, Sweater knit, Sweatshirt fleece and Jersey. Uses 2 yards/180cm of 60”/150cm width fabric or 2 3/4 yards/250cm of 45”/115cm width fabric. Click on the “Additional Information” tab for sizing, pattern details, and more. Take 20% off any pattern! Runs until midnight Monday November 26 (PST). No code needed. Happy sewing! + Get behind the scenes peeks, and even occasional coupons! Each pattern designer uses her own pattern block and size chart. 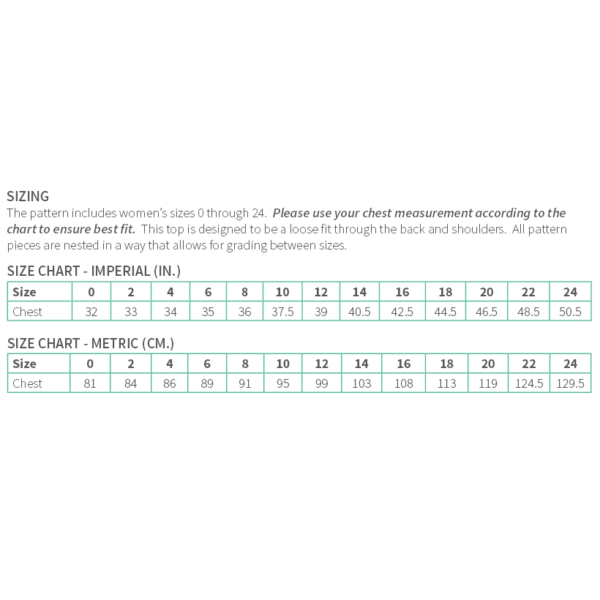 Each pattern’s size chart is included in the product listing so you can ensure that the pattern will fit your body. 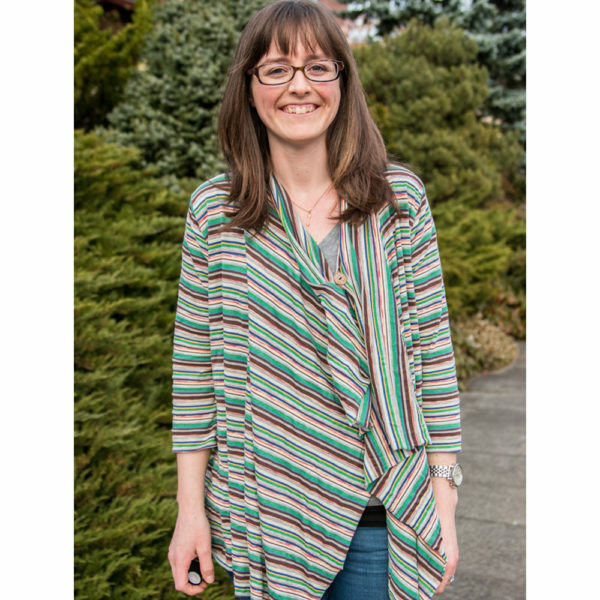 Most designers suggest that you pick a size based on your pre-pregnancy measurements (especially for “maternity specific” patterns) and account for an average pregnancy weight gain in their finished patterns. If you are on track to gain significantly more or significantly less than average then you may want to select a larger or smaller size accordingly. “Maternity friendly” patterns may not account for a pregnancy weight gain and so you will probably get the best fit from going up 1-2 sizes. To make it easier to browse for patterns that include your size, we have annotated all patterns as to how they best fit on the above size chart. 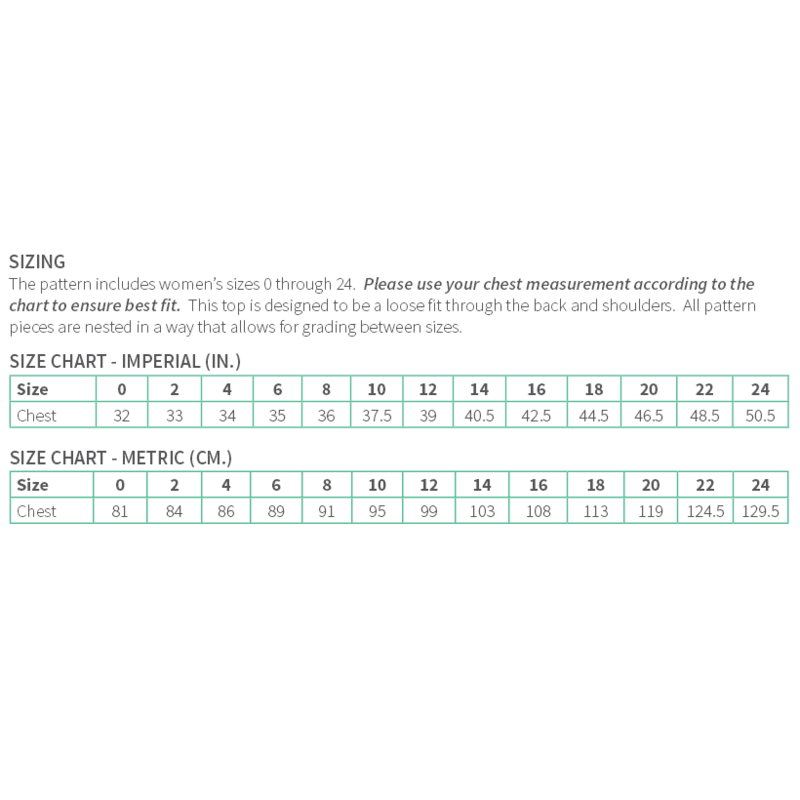 So if you wear a size 18 on the chart above then patterns marked as including size 18 will have a size with similar measurements included in the pattern. Again, each designer uses her own size chart so it may not include the exact measurements. Note that the size chart uses high bust NOT full bust for size selection. This accounts for the fact that different patterns are designed with different cup sizes. Cup size is typically measured as the difference between your high bust and your full bust. A = 1″ difference, B = 2″, C = 3″, D = 4″, E = 5″, F+ = 6″ or more. It is likely to be similar to your bra size. Because each person’s body has its own unique shape, for perfect fit you may still need to adjust a pattern even if it is the “correct” cup size to start. During pregnancy, your breasts are likely to grow and you will probably find yourself 1 to 3 cup sizes larger than before pregnancy, depending on how much weight you gain and how your own unique body changes with weight gain and hormones. Early/Post Maternity: In the first trimester your belly may not look any different but you may feel bloated and find fitted garments, particularly waistbands, to be uncomfortable. You may find that your bust is already noticeably larger. In your second trimester your belly will really start to grow. 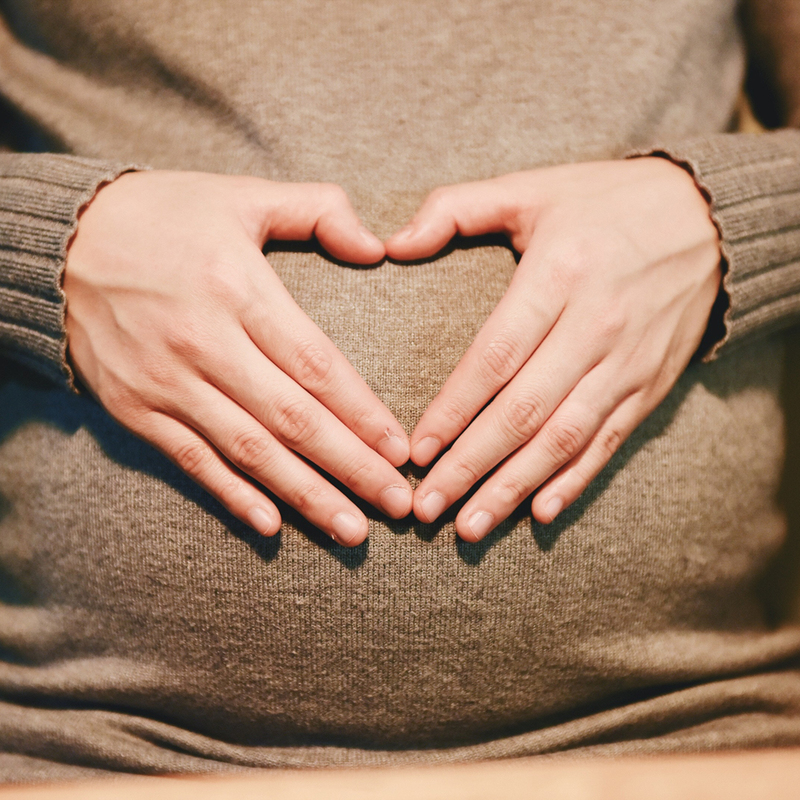 In your fourth trimester (post-partum) you will still have a round belly but are likely to want to camouflage instead of show off your curvy belly. Garments that cling to the belly or garments with excessive gathering at the belly are not well suited for this reason. Maternity Sewing stocks a variety of patterns that may not have been designed as maternity patterns but are well suited for wear during the first, second, and fourth trimesters. 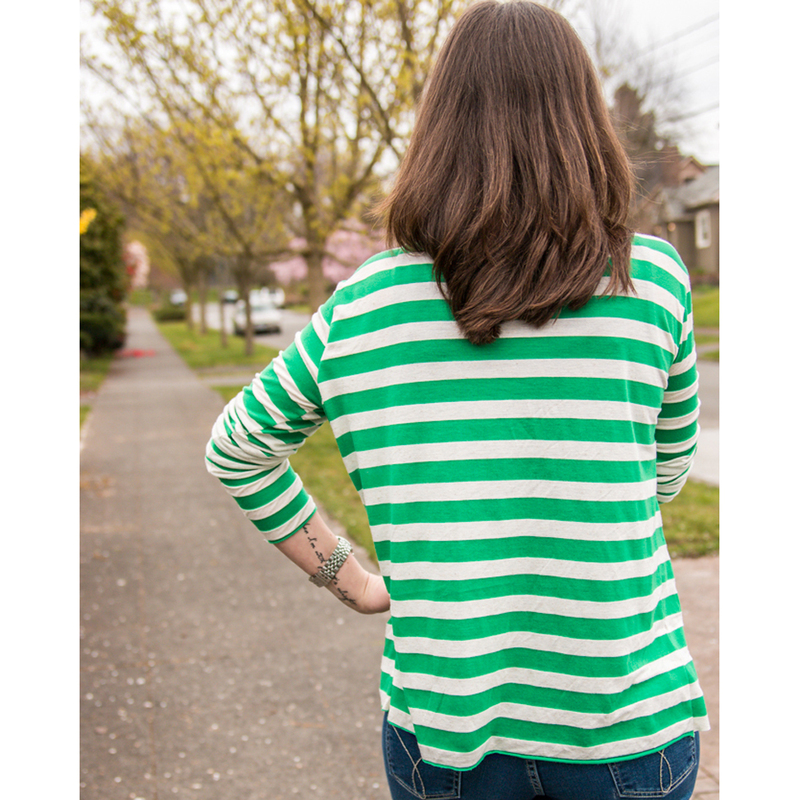 Late Maternity: Maybe in your second and likely in your third trimester your belly is large enough that you can no longer wear non-maternity garments. 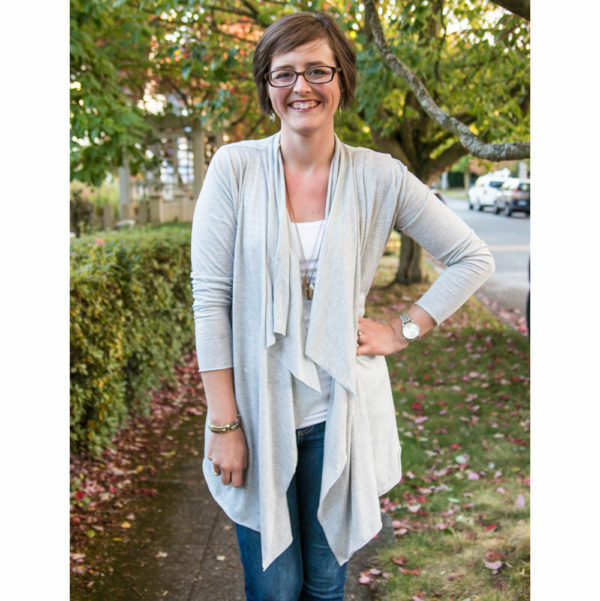 Garments in this category have specific shaping meant to accommodate the largest pregnant bellies. These garments may not fit or flatter on a body without a large pregnant belly. Designed for Nursing means that the garment is specifically designed for nursing. This may mean nursing clips on the front of straps, extra moveable panels across the bust, or strategic garment openings. Note that you may still find nursing to be easy in a variety of garments that are not specifically designed to be nursing garments but only garments with specific nursing modifications are included in this category. We have asked designers to rank the difficulty of their patterns as suited for beginner, intermediate, or advanced sewists. While most patterns are drafted for an average height, some are specifically drafted for short/petite women or tall women. Additionally, some patterns include multiple pattern pieces drafted separately for multiple heights. Note that average patterns may include shorten/lengthen lines on the pattern to simplify adjusting the pattern for different heights however these will only appear under “average” search terms. In garments with a waistline (especially skirts and pants), the waist of the garment can tuck under the pregnant belly or it can cover the belly. You may find that under-belly garments are easier to wear during early pregnancy and postpartum however many women prefer over-belly waistlines during mid- and late-pregnancy as a snug waistband can be uncomfortable at the under-belly. Since all patterns on MaternitySewing are digital at this point in time, you must print your own patterns after purchase. Printing can either be done on your home printer (either 8.5″x11″ or A4) or on a large format printer at a copy shop (wide format or A0). Many patterns include both options. We know that we are lucky. There was no doubt for either of us that we would have ready access to maternal healthcare while we were pregnant. Unfortunately, that isn’t true for so many women in our world. We pledge to donate 5% of our profits to the non-profit Every Mother Counts. They work with agencies around the world to improve maternal medical access. Give thanks for your access to healthcare while pregnant by making a donation. We will pass the full amount to Every Mother Counts to help bring maternal healthcare to women around the world. You can use the suggested roundup amount that rounds your purchase up to an even $10 amount or enter whatever donation amount you would like.